One in which ecology is considered before programming. Yesterday at noon, we jumped in the car to drive to the other side of downtown to participate in one of the oldest, time-honored Dallas traditions: witnessing the unveiling of yet another grand plan for the future of the Trinity River. We had been invited to preview a new design for Harold Simmons Park, which is planned to be housed in a 200-acre space between the Ron Kirk Pedestrian Bridge and Interstate 30. The Trinity Park Conservancy, the nonprofit that is overseeing the park’s development, had invited some of the designers to town to unveil the project at Gilley’s in the Cedars. It is a process born of weeks of public meetings and years of plans that have never materialized. Given the long, troubled history of the project—from botched whitewater features and broken Calatrava Bridges to jugglers under overpasses and vanished dreams of majestic toll roads—it was impossible not to harbor a healthy dose of skepticism heading into the meeting. However, walking into Gilley’s and seeing the rendering of this latest iteration, printed on white fabric, backlit and stretching 60 feet across the length of a western ballroom, it was clear that something about this plan was different than all the plans that had come before. 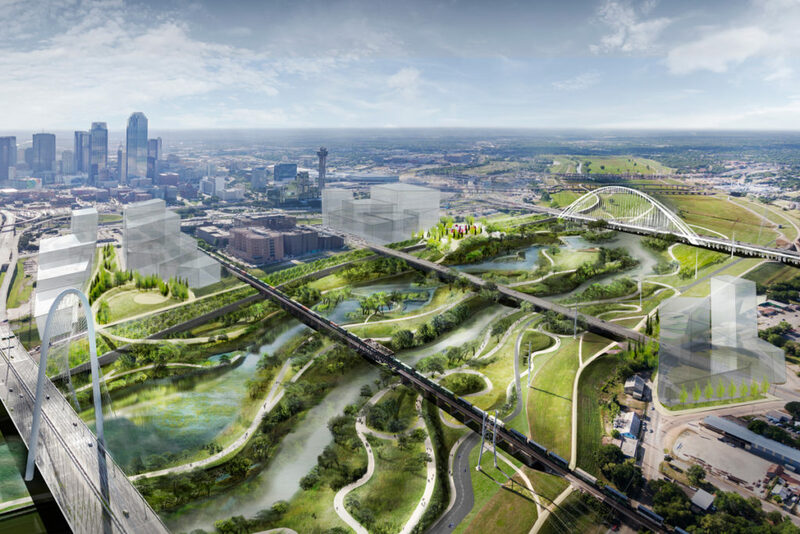 The sprawling image was not a bird’s eye view of a new Trinity River fantasy, and it didn’t necessarily depict a park, per se, or a refined idea or singular concept for a reimagined Trinity River. Rather, the image showed a long, horizontal cross section of the floodway, a ground-level view of the manmade channel, managed grasslands, and levees that run past downtown Dallas—interrupted, now, by new undulations of terrain, wetlands, side channels, elevated gathering places, a few paths, new access points and pedestrian bridges, and urban-style parks perched up on top of and just beyond the levees. The designers admitted that this was an early stage mock-up of a wide variety of ideas for a 200-acre subsection of the Trinity floodway. But what was more interesting about the rendering was not the specific improvements it depicted, but how the drafters of the plan had settled on them. All ideas came out of a close consideration of how water moves through the floodway. 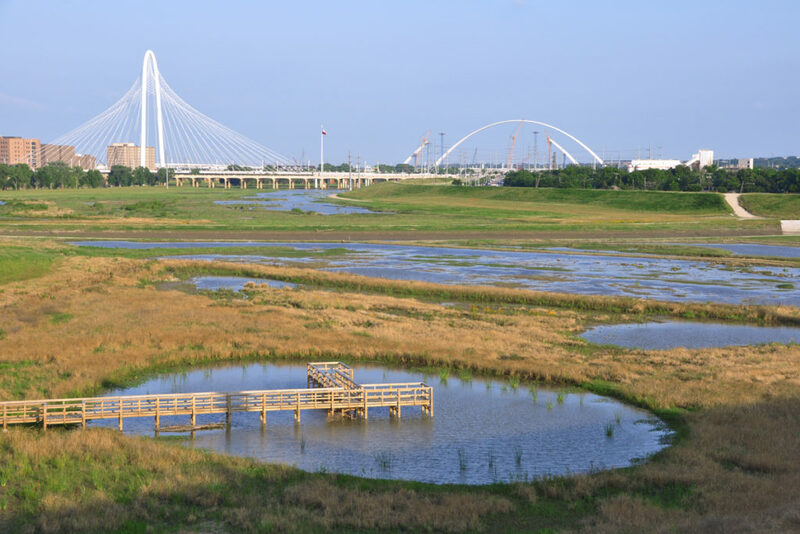 During flood events, the Trinity River returns to the natural wetland it once was. They have made early attempts to crunch the numbers and understand regular flooding, predict continual erosion, and gauge the impact of introducing additional trees, wetlands, small river channels, pedestrian bridges, and hollowed-out or elevated sections. They want to know the role of all of these things in a restored riverine ecology. The designers’ hope is that water flow can be harnessed in such a way that it helps restore that natural ecology to the Trinity and allows for the addition of some urban park amenities. The public event—two and a half hours, half meet and greet, half presentation, with a cash bar and light bites—was something of an effort to prove these things can coexist. And that was the fundamental shift in the momentum behind this iteration of Trinity River planning. The plan was introduced to the public not as an architectural product, but as process of design and scientific analysis. That’s vitally important, because all the past ideas for the Trinity River have been impositions of Dallas’ ambitious imagination on the floodplain, and those ideas have come undone as the planning process moved closer to confronting the undeniable reality of the floodplain’s natural and engineered ecology and hydrology. Speaking with three of the principal designers behind this new plan—Liz Silver, associate principal at Michael Van Valkenburgh Architecture; Tim Dekker, president of LimnoTech, an environmental engineering and science firm based in Michigan; and Matt Urbanski, principal at Michael Van Valkenburgh Architecture—it was clear that there was a new respect for the way those scientific realities would have to play a role in dictating any adjustments, manipulations, or construction in the floodway. At the presentation later in the evening, the team, joined by superstar landscape architect Michael Van Valkenburgh, Urbanski and his colleagues dug into the details of these “moves.” They began not with the promise of amenities, but with a science-heavy explanation of the ecology of the river. It sent a clear message to the audience: to understand the ideas, they would have to understand the river. Dekker explained the series of reservoirs that stretch out beyond where the river is now, allowing for the collection of more than 2 million acre feet of water—that’s 1 acre, a foot deep—and explaining that the floodway fills up after a big rain as the waters slowly drain through those reservoirs. (For reference, the 1908 flood dumped a quarter of its total capacity on the city.) This is what the teams have to work with. They are digitally mapping the entire floodplain to understand stress points. The river will be widened to improve the flow of water. They will likely modify the banks and shift the grade to encourage people to walk down the levees and experience the river. They will use the data to determine which plants and animals will be able to live in which parts of the basin. The areas nearest the river will be wetter; the areas higher will be dryer. Trees will be planted high enough that they will not be affected by common floods. There will likely be a side channel created, accelerating what the scientists believe would happen naturally in another thousand years. They are gently enhancing the natural possibilities for the basin by understanding its form, function, and ecology. This is a unique project for Van Valkenburgh’s firm. Not only is there a delicate ecosystem to manage, but there are enormous earthen mounds that shoot up on either side. The levees would house the more traditional amenities—playgrounds near the edges, outdoor cafés, spaces for movies to be projected, areas for grilling or hosting reunions, space for quiet respite. Urbanski clicked through slides showing an assortment of uses: strolling, biking, performances, playing, fishing (good luck), birdwatching, education, kayaking, exercising. The digital mapping extends here, too. The designers will map the heights where the water reaches and design in anticipation of those flood events. On each of the cross sections on the 60-foot cloth image, the designers included little blue lines representing where the water had crested during significant floods, including 2015 and 1908. You wouldn’t put the playground in the floodway, but maybe just beyond the levee, near the entrance, working as a connector between the edge of the park and the city. There is a practical as well as philosophical consideration driving all this attention to water. The Trinity floodway is managed by the U.S. Army Corps of Engineers, and anything that happens within it will require the Corps’ approval. The existing Record of Decision that was approved by the federal government back when the city was still attempting to shove a tollway into the floodway describes exactly what can and can’t be done with the Trinity. The park planners say that all their designs take those required water flows into consideration, and they say the Corps will be involved in the ongoing planning process. If anything, taking the road out of the equation has made meeting the Corps’ requirements less complicated, Urbanski said. Can all this money be raised? That’s just one of the still unanswered questions facing this latest iteration of the Trinity River park. Other questions are related to those typical Trinity challenges of wrangling complicated bureaucracies and the shifting aspirations of philanthropy. For example, while the current plan takes into consideration the need for low-maintenance facilities in the floodway, reserving more managed and urban-style amenities for the leveentops—outside of the reach of frequent flooding—there will need to be a budget for ongoing maintenance of the park. How will that money be secured and sustained? And will any of the raised funds come with strings attached, requiring certain projects, amenities, conditions of access, or other changes, as they have sometimes in the past? Furthermore, there are individuals who have been long-vested in the future of the Trinity. Will developers, city and regional officials, and other interests begin to influence the design process as they have in the past, or is the structure of this new process—led by a nonprofit, contracted through a local government corporation that is subject to the City Council—be resilient enough to stay true to its stated spirit and goals? And can the Trinity truly serve its stated goal of bridging Dallas, both literally and metaphorically, as the designers emphasized during their presentation? Or, will the construction of the park be a continuation of the process of neighborhood disruption and displacement that has followed in the wake of other Trinity improvements? These are just some of the considerations that will make meeting the park’s current timeline—the Conservancy says it hopes to break ground by late 2020—a challenge. Brown says he would like to start the fundraising push by next spring, but he also doesn’t want to put the cart before the horse. Before the Conservancy asks for money, Brown wants there to be a clear and concrete idea of what they plan to do with those raised funds. Also, concurrent with designing the ecological and recreational improvements to floodway and levee, Brown says he wants to initiate future planning around equitable economic development, as well as mobility studies of how to best tie the park into the existing city street grid and future multi-modal transportation options. This all sounds like another dramatic shift in the attitude shaping the vision for the new Trinity. It’s always difficult to not harbor some skepticism about all things Trinity. We aren’t that removed from the days of the old Trinity strategy, in which pretty pictures were used as cover to pick the pockets of city coffers and lay the groundwork for highway development in the floodway. But this latest effort represents a refreshingly holistic approach to thinking about the Trinity. And at its core is a seeming desire to reestablish public trust in a project that squandered that trust long ago. It’s still early. But it all sounds like a remarkable change of course.